Gwadar: Coastal Command has decided to establish a pre-joining training centre at PNS Akram in Gwadar for the induction of local people into the Pakistan Navy. During a press briefing officials of Coastal Command, COMWEST Command is under the Coastal Command, which is one of the six field commands of Pakistan Navy, informed the media that it has been observed that a large number of candidates from coastal areas are withdrawn from training due their inability to adapt to new environments and coup up with the standards. “Afeasibility has been proposed for setting up a pre-joining training centre at PNS Akram. It would be set up for 60-70 candidates for imparting training of 04 weeks. The training of first batch will commence by the month of June,” he said. Coastal Command has urged the government to initiate development projects in Coastal region of Balochistan with the coordination of local fishermen and review the under construction projects since it is creating mistrust between the institutions and local people. The media was informed that Provincial government started a number of projects for the betterment of local populace in order to boost living standard of the fisherman communities. “The construction of jetties was commenced at Jiwani, Pishukan and Sur Bandar. However despite lapse of considerable time all these jetties are yet to be concluded,” they said. Though the one at Sur Bandar has been recently commenced however its fate as is envisaged to be the same. “Such activities have gravely perturbed the local populace and have developed mistrust on government institutions. Therefore there is a need to review these projects and plan their construction in coordination with the local fishermen community. About the Dredging at Pasni Fish Harbour, the official said Pasni fish harbor was constructed in 1989. As per designed requirement the breakwater was to be extended further 150 meters. However, after a lapse of 20 years same was not completed, resultantly heavy siltation has occurred inside harbor render it in-operative. Subsequently Japan government rendered Rs. 800 millions grant for its dredging. However since last two years the harbour is non-functional. On numerous occasions local fishermen have approached PN for the dredging efforts. Geo-strategic challenges have brought about a paradigm shift in the global security calculus. These have influenced the maritime security environment as well. Tthe Global Maritime Context, there is a visible shift from Blue water i.e. open ocean operations to operations close to the coast commonly known as littorals. As a result Navies of the world are now increasingly focused on policing roles and Maritime Security Operations against asymmetric threats. In the Regional Maritime Context, energy security has emerged as a vital interest, and Makran coast is most significant in Indian ocean littorals due to proximity to the Persian Gulf oil shipment route on which approximately 17 million barrels of oil is shipped daily. Development of port and maritime infrastructure along the western coast provides immense economic benefits. It provides superior strategic orientation to PN vis-à-vis its neighbours offering flexibility in Maritime operations. The Providing support for Fleet operations at sea through coastal surveillance, provision of logistics and technical support to PN ship’s, S/Ms and aircraft operating from coastal areas including establishment of secondary Maritime HQs and Dockyard at JNB. Pak Marines actively participated in relief operations during Cyclone in Creeks Areas in years 1999, 2000 and floods in 2010 and 2011. Through their dedicated efforts, many precious lives were saved during these disasters and people were provided with timely relief. These operations were facilitated through utilizing manpower, helicopters, boats and hovercraft. In 2010, PN assets were deployed in Charsada and Nowshera regions in KPK, while in Sindh, the operation was carried out in 14 districts, it started from Kashmore District in the North to Thatta in the South. During these operations over 2,23,000 people were rescued. Health Care Services. Ladies and gentlemen, the addition of PNS DARMAAN JAH in western coastal region has been instrumental towards providing quality health care services to locals. It is the most modern hospital South of Quetta and West of Karachi, having facilities such as trauma centre, labour room, operation theatre, ICU, dentistry and even a dialyses unit. 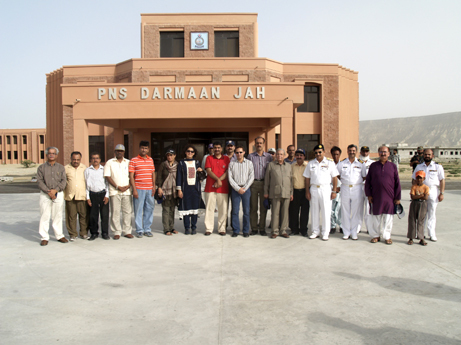 Thus for, over 11,000 civilian patients at OUTDOOR and over 100 admission cases have been provided free health care services at PNS DARMAAN JAH since its commissioning. On average Rs.1.2 million are being spent on free medicines and other procedures of civilian patients on monthly basis. Initially 25 bedded facility has been developed which would be progressively enhanced to a 100 Bedded hospital with complete range of modern medical facilities. Apart from Medical services being rendered through PN Hospital, free medical camps in the entire coastal belt is a regular feature. Mainly the camps are organized at Gwadar, Pasni, Turbat and Jiwini areas where free medical check ups and medicines are provided to the civilians. Moreover, different specialists visit Gwadar on fortnightly basis to facilitate local population. HQs Coastal Command has also initiated a programme of free education for Baluchi students at PN Model Schools at Karachi. About 30 selected students are being provided with free education alongwith boarding & lodging facilities by PN. In order to encourage and motivate the young generation of this province, Govt Boys High School Ormara has been adopted by PN since 2000. The efforts put in by PN have resulted in improving the secondary class’s results. The major support provided by PN that are included Distribution of Free Text Books, Replacement of Old furniture, Provision of Lab equipment, Setting up of library, Provision of Sports gear. Moreover, Govt school at Surbandar has also being adopted by PN for provisioning of quality education to area children. PN is working to establish a cadet college at Ormara to afford modern educational facilities to the youth of this region. Ground breaking ceremony of college is planned shortly. COMSATS institute of Information Technology (CIIT) is also considering to establish their campus in Ormara in near future. Independent units of NUC are being run at Gwadar and Ormara to offer daily use commodities at subsidized rates to service personnel and civilians in the area. Recently PN has opened a PN Recruitment Centre at Gwadar to facilitate coastal population in induction process. Furthermore, Pre Joining Training Centre is also being established at Gwadar shortly, which will offer pre-joining training to locals, selected to join PN, so that they are able to compete with the rest of the recruits selected from all over the country in PN Training Establishments. In last couple of years about 150 locals have joined PN as sailors and about 200 have been inducted as Civilian. Focused induction schemes alongwith various relaxations in terms of educational standards and age requirement are being afforded to the local populace. Furthermore, in order to facilitate induction of Balouchistan youth into PN officer cadre, a special Short Service scheme for locals has also been introduced. Coastal command is now well established performing its assigned tasks effectively. It is playing a vital role in supporting other commands of PN, development of maritime infrastructure, protection of economic interests along the coast and socio-economic development of coastal areas. Coastal Command continues to strive for achieving the envisioned future of Pakistan and Pakistan Navy. Media was informed that Turbat being the major population centre in MAKRAN Division is also being focused by PN and a Naval Air Station is being developed there as per operational dictates. In order to assist locals apart from PN and other armed forces personnel, it is planned to establish a hospital like PNS DARMAAN JAH at Turbat in near future. This entry was posted in News and tagged Baluchistan, Gwadar, Navy, Navy in Gwadar, Pak Navy, Pakistan military, Pakistan Navy, Pakistan news, PNS Akram. Bookmark the permalink.